Many employers in New York and New Jersey ask or require their employees to sign arbitration agreements as a condition of being hired or remaining employed. Typically, these contracts require you to bring any legal claims you might have against your employer through arbitration instead of through the court-system’s litigation process. In other words, they require you to waive your right to file a lawsuit and have a jury decide your case, instead requiring you to agree to have one or more arbitrators decide it. Employment law arbitration provisions also severely limit your right to appeal any ruling. This means the arbitrator’s decision is usually final and binding. Should I Agree to Arbitrate Disputes with my Employer? Theoretically, employment law arbitration is better than litigation because it is supposed to be faster, less expensive and more efficient. However, in practice it is often just as expensive and time consuming as litigation. Worse yet, experts seem to agree that arbitration tends to be more favorable to the employer than the employee. 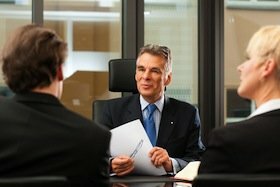 As a result, it is highly recommended that you speak to an employment lawyer before you decide whether to sign or accept an agreement that would require you to arbitrate your workplace disputes. This includes, for example, an arbitration agreement in your offer letter, employment contract or the acknowledgement page to your employer’s employee handbook. Is it Possible to Avoid Arbitration? If you already have signed an arbitration agreement and have a legal claim against your employer, Rabner Baumgart Ben-Asher & Nirenberg, P.C. can help you. We are experienced at reviewing arbitration agreements to identify reasons why they might be unenforceable or might not apply to your claim or situation. We are skilled at fighting employers that attempt to improperly force employees into arbitration. Can Your Firm Represent Me in Arbitration? If you already have entered into an enforceable arbitration agreement, our employment law attorneys still can help you. We can represent you at arbitration regarding your discrimination, harassment, retaliation or other employment law claim. Not only do we handle individual claims, but we also represent clients in class action arbitration including overtime claims under the Fair Labor Standards Act ("FLSA") and New Jersey and New York wage and hour laws. We handle cases under the Federal Arbitration Act ("FAA") as well as under New Jersey and New York State law at the American Arbitration Association ("AAA"), JAMS and the Financial Industry Regulatory Authority ("FINRA"). We can help if you are looking for legal advice regarding your arbitration agreement or if you would like to initiate an employment law arbitration in either New Jersey or New York. Please feel free to call us at (973) 744-4000 to schedule an initial consultation with one of our experienced employment law attorneys. Or if you would prefer you can contact us online.